When you are looking to sell a boat, installing a quality marine stereo system can definitely up the curb appeal. The typical lifespan of a marine stereo is about 5 years, so that is something to keep in mind. Speaker cones will get brittle and start to break down, affecting the sound quality of your system. Plus, advancements in technology have simply made many of the older stereos obsolete. Ever try connecting your iPod to an old cassette receiver? Yeah, it doesn’t work so well. To make the system most appealing to a potential buyer, consider a stereo that will play music from many different sources. You may not listen to CDs much anymore, but your buyer may have a massive collection that he will want to play on his boat. A 3.5 mm audio input jack is must. That assures that any device with a headphone jack can patch the audio directly into the stereo. That having been said, iPhone 7 does not have a traditional head phone jack so don’t expect all devices to be able to connect that way. Wireless Bluetooth connectivity is very popular and will be a big plus for buyers. But all devices need to recharge, so it is a good idea to have a USB port on the stereo as well. Another important factor to consider are the conditions that the marine stereo will be exposed to when it is installed on the boat. Will it be subjected to rain and splash? If so, you will either want to make sure the model you are purchasing is completely waterproof, or you will want to get a splash cover to protect it. Even if your head unit will be in the cabin, a marine stereo is a good idea because it will have plasticoted circuit boards to prevent corrosion in a salt air and humid environment. 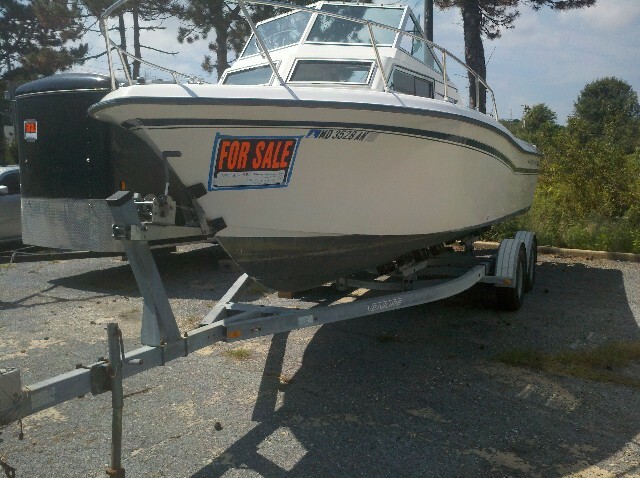 When purchasing a used boat there are a number of things you will want to look for to assess the quality of the vessel. Starting on the outside, you will want to check for corrosion on the out drive or lower unit. Make sure the cables are in good shape and also that the prop looks to be in good condition. Make a visual check of the fiberglass exterior. Make sure the rub rail is intact and not excessively damaged. Also look at the hardware and the gel coat to make sure they are good shape. The trailer is just as important as the boat. You will want to check the wheels and axles. If there are brakes, you will want to check those as well. Make sure the lug nuts are nice and tight and that the tires have some wear left on the tread. Inside, take a look at the upholstery. It will likely not be perfect, but check the stitching to make sure it is solid and for any excessive wear or tears that need to be repaired. Walk around the floor, checking for any overly soft spots. If it has some give to it, that might be a sign of concealed damage. Important safety systems to check include the bilge pump and the battery. The blower on an inboard type engine is important as well, to keep the engine cool. It’s a good idea to check the oil and other engine fluids. If the oil isn’t clean, that is a good indication that proper maintenance may not have been performed on the boat regularly. Check the engine for excessive corrosion. Keep in mind that it is a used boat, so it won’t be factory perfect, but a heavily corroded engine is definitely a red flag. A water test is imperative. Get it out on the water and test all of the systems to make sure they are working properly and to also determine if you like the feel of the boat. For most people, buying a first boat is one of the most important financial decisions they will ever make next to buying a house. There are so many different things to consider. For someone new to boating it can be a particularly large challenge as they don’t always know exactly what they want and expectations may be much too high. The perfect boat does not exist and usually there is some kind of sacrifice that must be made. First it’s important to identify who the boat is for. If it is just for a couple, then things are wide open. However a family of five will have different requirements. You may need multiple cabins for sleeping arrangements. Will the boat be used in fresh water or salt? A river boat may not be as flashy looking as a large sport cruiser, but it may fit the buyers needs the best. The proper boat in the proper environment may provide more longevity. If you are looking for a family boat, you may want one where a few people can sleep aboard for a weekend getaway. As the boats get larger, not only can they sleep more people, but their range increases. Larger boats can navigate the ocean and allow for family trips. A typical 6 berth boat may be about 30 feet long and 10 feet wide with 3 cabins. A 160 horsepower engine would be ample power. A chart plotter comes in hand for navigation and you may want to consider a depth sounder if you plan on doing some fishing. Suppose your boat needs to fit under a bridge. Your boat may need a lower profile than some. Or perhaps fuel efficiency is important. That is something to look for as well. Just looking at a boat from the dock is not enough. The most important thing is to get out on the boat to get a feel for what it can do. There are basically four stages that boat restorers go through when addressing rot. First is realization of the problem, then denial, finally acceptance and then repair. It is easy to go into a restoration thinking that the rot problems are not very bad, because they often don’t look too bad superficially. But when you get down into it, you often discover that a little problem tends to be much worse than you think! Once water makes an intrusion into the wooden portion of your boat, it is bad. It will keep going and festering until it is fixed. Sometimes rot will happen from inside the boat. Water will sit in a low spot on the deck, get under the carpet and start the rot from there, but that is actually not very common. Usually the deck is fully fiberglassed so the water will simply evaporate with no problem. The most difficult kind of rot to deal with, and unfortunately, the most common is rot from underneath where water penetrates through the hull. The moisture tends to condense under the deck. The underside of the deck is usually just bare wood so it is very easy for rot to begin from there. No matter what kind of boat you own, whether it be an old classic or a new runabout, you want the fiberglass to look new and shiny. The key to doing that is getting rid of oxidation. Oxidation is the chalky dull color that the fiberglass surface gets. It takes a lot of elbow-grease to get off the oxidation so you will almost certainly want to use a power buffer. When you use a power buffer, it is important to first tape off the rub rail and any fittings that you don’t want damaged or scuffed up. After you apply the liquid wax or buffing solution, be sure to push the buffer up against the side of the boat before you start or it will fly everywhere! Fishing boats tend to get a lot of blood and chum on them so they need an extra coat of protection compared to other vessels. It’s a good idea to use a paste wax so that the debris can easily be removed. To finish off, use a marine polish or carnauba based wax. Last summer my wife damaged one of the seats in our Glastron boat so I pulled it out to fix it. When I took it to the upholsterers to fix the tear in the vinyl, they unstitched it and discovered that the inside of the seat was starting to rot. The problem was that it is a rounded corner seat and the wood inside was originally steam bent at the factory. I don’t have the kind of equipment required to do steam bending in my garage! So we kicked around a few ideas until we settled on a solution. This may not be the way it would be done in a factory, but I think it worked out fine. We ended up recreating the bent wood with a series of thin strips of plywood lined up next to each other and taped into position. I’m really happy with the way it came out!